The Acer Aspire V3-571-8469 is an entry level gaming notebook recommended for gamers on a strict budget and who don’t mind playing the most demanding games released in 2011 at low to medium graphics settings. At $440, the Aspire V3 series, specifically the V3-571-8469 offers good value for the money for gamers who are still challenged by some of the best games released in 2011-2012 and don’t mind playing them at low settings. With a dedicated graphics cards that’s head and shoulder above the cheapest notebooks with integrated CPU + GPU on a single chip, it offers a wonderfully cheap gaming computer value for gamers with a tight budget and who recognize the limits of what they can afford. A visit to the Amazon page on the product shows 4-5 star ratings from more than 40 customer reviews. Check out yourself. At its price point, the impressive thing about this laptop is its quad core engine from AMD, the A8-4500M whose 1.9 GHz clock speed can be booted to run at up to 2.8ghz with TurboCore technology. The engine is not as muscled as the I5 dual core from Intel but is certainly faster than the i3. It is paired with an AMD Radeon HD7640G graphics engine that has its own video RAM albeit at a modest 512 MB. 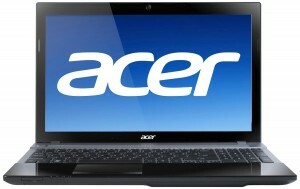 Bundled with the latest Windows 8 OS, this Aspire model boasts of a 15.6-inch LCD screen with an HD resolution of 1366 x 768. It comes with a 4 GB DDR3 SDRAM, a 500 GB SATA hard disk drive running at 5,400 rpm and an 8x SuperMulti Double layer DVD drive all housed in a slim body with just 1.3-inch profile thickness and a 5.7-lb weight that’s light enough to carry in a backpack. Data connectivity is supported by Bluetooth 4.0, WiFi 802.11 b/g/n, two USB 2.0 ports and a single one USB 3.0 port, and one HDMI port. A user-removable 6-cell li-ion battery rated at 4,400mAh powers the notebook for up to 4.5 hours. Surfing the net over WiFi brings this down to about 3 hours. Wireless data connectivity is supported by its WiFi 802.11 b/g/n and Bluetooth 4.0, while wired connectivity is supported by a couple of USB 2.0 ports and a single USB 3.0 port, along with a single HDMI port. The Radeon HD 7640G in the Aspire V3-551-8469 is the third fastest in the Radeon HF7000G series and the second fastest featured only in the A8 processor series. It has enough polygonal rendering muscle not to disappoint gamers who has modest expectations for a gaming notebook at this price point. It can play just about all the popular titles like Deus Ex Human Revolution, Dirt Showdown, Diablo 3, Anno 2070 and StarCraft 2 with ease on a tweaked low graphics setting. Dirt 3 and Fifa 12 can go medium while Skyrim: Elder Scroll V will be challenged even at low setting. . In addition to the competent graphics, this Acer Aspire model offers Dolby Home Theater audio management system that allows you relish the sounds of your HD movies, as well as your music, especially with decent headphones. It also comes with a 1.3 megapixel camera with 1280 x 1024 resolution for your video chat sessions online. While the graphics card with DirectX11 can run some of the most sophisticated games on the market, it can do so at the lowest game settings. This and its other modest features are expected for a budget gaming notebook. The 500GB drive will need added space along the way with an upgrade or an external drive if you have a library of games to load into it. And as most touchpads go, an external mouse is a better option for controlling your games. Gaming notebooks powered by the A8 engine are generally considered entry level or a poor man’s gaming notebook and is recommended for gamers who are on a strict budget and who don’t mind playing most of the popular games in low settings. With its decent dedicated Radeon graphics card, the Acer Aspire V3-571-8469 offers decent gaming with superb multimedia features. It can also be an excellent gift for your kids just discovering the joys of PC gaming.Check out the cheapest deal on the market that we’ve found. (This shares about the same features as the HP Envy dv6-7210us which has a bigger 750 GB SATA drive, a lighter 5.4-lb weight and 6GB DIMM RAM, but priced $112 higher). 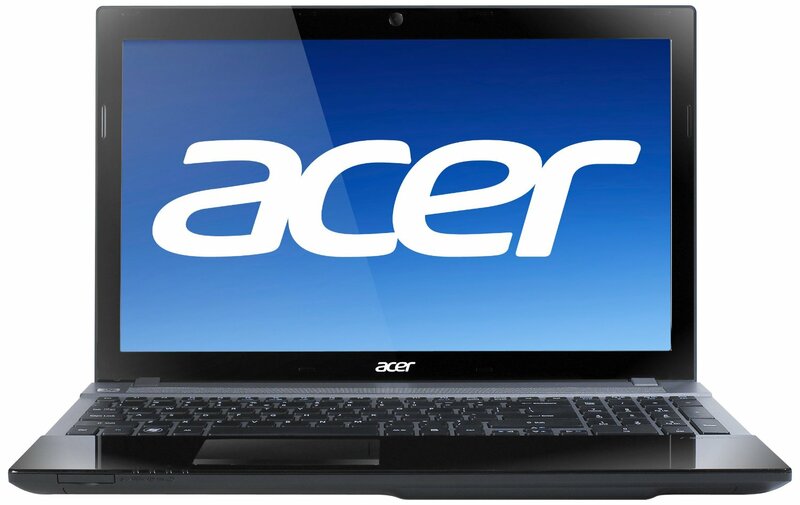 The Acer Aspire V3-571-8469 is an entry level gaming notebook recommended for gamers on a strict budget and who don't mind playing the most demanding games released in 2011 at low to medium graphics settings.